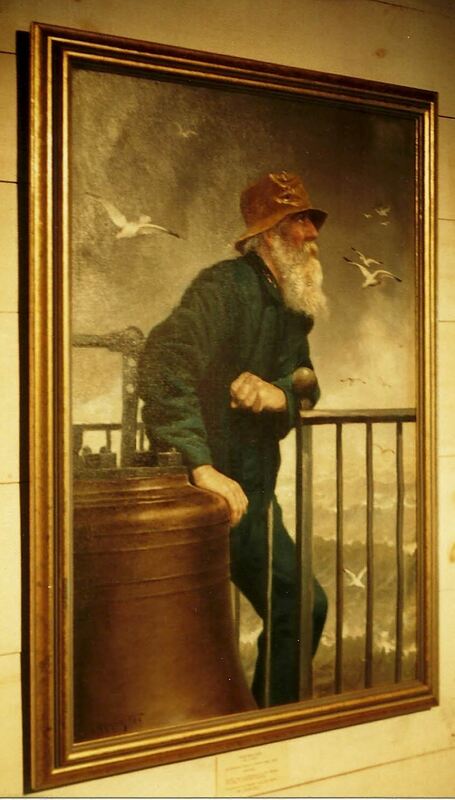 A rare fox print found on page 145 of the Gibson book depicts a gray bearded man standing in the light house surrounded by the roaring sea and soaring seagulls. This print is “On The Alert” and is based on an oil painting produced by Fox in 1904. 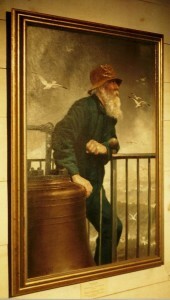 The original image that Fox used to create this painting is found in the November 5, 1904 publication “Outlook” and seen on the second page of the article “Signals of the Sea”. The photograph was taken by the author of the article, Arthur Hewitt and is titled “On The Lookout”. The author describes his visit to the Minot’s Ledge Lighthouse. The painting measures 37.5“ X 25” and was originally purchased by the son of the subject. “R. Atkinson Fox” signature is found on the bottom left corner. The subject of the oil (and photograph) is Roscoe Green Lopaus who was born in Tremont, Maine in 1845 and died in Chelsea, Massachusetts in 1912. Lopaus was 2nd assistant keeper at Minot’s Ledge Lighthouse from 1896-1905. The painting was eventually donated to the Cohasset Historical Society and can be viewed in one of the exhibition rooms at the Caleb Lothrop house in Cohasset, Massachusetts. It is not currently known when the print “On the Alert” was published. If you own this print, please send us a photo so we can add it to the gallery. I have a copy of “On the Alert” and showed it to Rita at the Fox Convention held in Iowa about 1990 or ’91. I bought it in a box of misc. loose prints at a small antique shop in MD. Hugh Hetzer used to joke about me nabbing it out of his “back yard”. I will try to send you a photo or post it online. I dont have it in front of me right now, but if my memory serves me, there is no publishing info on it. I always had a suspicion that it was a publishers proof though I have no way to verify that.